The Panetta Institute offers a variety of study opportunities for students interested in leadership, public policy and experience in public service. The Institute’s instructors offer a blend of academic expertise and real-world public policy experience. By invitation, selected students study with individuals here who have worked successfully in government and politics. Co-founded by Leon E. Panetta and Sylvia M. Panetta, the Panetta Institute is committed to inspired leadership and to creating opportunities for education and debate. The Institute works with leading experts and officials from national, state and local governments, as well as the private sector, to discuss how policymaking works in practice and to help us serve our students and our community. In keeping with that emphasis, the Panetta Institute sponsors a uniquely designed Congressional Internship Program. 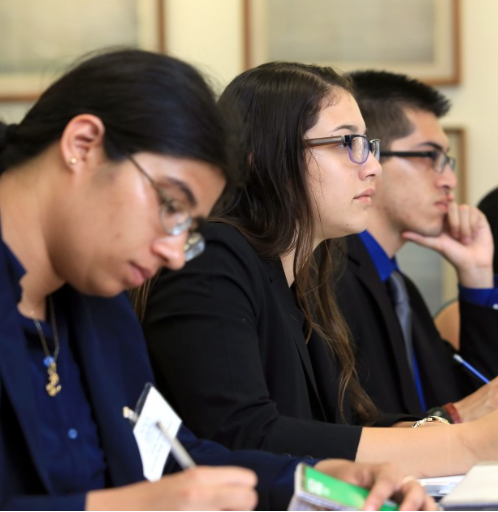 Participants are nominated by the president of each CSU campus, Saint Mary’s College of California, Santa Clara University and Dominican University of California, and then interviewed and selected by the Institute. The students then receive an intensive orientation course at the Institute before going to work in the Capitol Hill office of a U.S. Representative of the California congressional delegation. Costs for the program are covered by the Panetta Institute and participating students receive twenty units of credit upon completion of their internship. The Leon E. Panetta Archive offers qualified scholars a rich resource for studying the federal budget process, White House operations, the workings of Congress, and other areas associated with Mr. Panetta’s lengthy public service career. In 2000, the Institute launched the Education for Leadership in Public Service Seminar. The purpose of this one-week Leadership Seminar is to teach student body presidents and other campus leaders the essential skills and strategies of leadership and to find ways to engage young men and women in the nation’s political life. This Leadership Seminar is offered annually in June at the Panetta Institute for student-body officers selected by the office of the president from each CSU campus, Dominican University of California, Saint Mary’s College and Santa Clara University. In early 2006, the Panetta Institute launched the Policy Research Fellows Program with Santa Clara University School of Law. Today, highly qualified upper division law school students spend a semester at the Institute conducting research on issues of international, national, state and local concern. These promising law students acquire in-depth knowledge of the issues they research, gaining important insight into the workings of the American political system. This student research is also invaluable to the many activities and projects of the Institute. For more information about any of these study and research opportunities, please contact us.